Great Kia Stinger car Leasing & Contract Hire Deals. Our Kia Stinger Lease Deals. Think of everything you expect a Kia to be. Bet you're not thinking of anything like this. But then that's just the point. The Stinger has been designed to get you thinking differently. It's arguably more stylish than rival Audi A5 Sportback, BMW 3 Series GT and Volkswagen Arteon models. It's certainly much better value, will be better equipped and will probably offer you a lot more performance for your money. True, efficiency figures aren't quite up to Teutonic standards. And the boot is a little smaller than rival trunks. But otherwise, this design is impressively hard to fault. This is the South Korean maker laying claim to be a world-class car manufacturer. And with a Stinger in your driveway, that claim would seem to be very credible indeed. The Kia Stinger is a five-door 'gran tourer' coupe executive model that's been six years in the making. It is based on the brand's 2011 Frankfurt Motor Show 'GT Concept' prototype and for a long time following that unveiling, there were periods when it seemed as though Stinger would never make it into production form. Kia senior management were always enthusiastic about the idea though: they simply wanted to wait until the time was right. Perhaps we can see why. The Stinger is, after all, something of a game-changer for Kia and it's hard to believe that many customers for a luxury model like this with such an exalted price tag could have been found even two or three years ago. Now though, it's a car to convince people, if anyone still needs convincing, that the company has put behind it the days when it was a value-driven brand mainly concerned with durability and practicality. Those attributes are still important, but Kias are now highly desirable in their own right. The Stinger aims to epitomise that. Entry-level 'GT-Line' and 'GT-Line S' Stinger models are powered by either a 244bhp 2.0-litre four-cylinder T-GDi engine or a 197bhp 2.2-litre CRDi turbodiesel. They're both reasonably fleet, the 2.0-litre variant capable of 60mph in 5.8s en route to 149mph. With the diesel, the readings drop to 7.3s and 143mph, but an increase in torque from 353 to 440Nm means that in real world driving, the CRDi variant will probably feel much quicker. It's the top 'GTS' variant though, that should really get the juices following, this derivative featuring a potent twin-turbo 365bhp 3.3-litre V6 T-GDi engine beneath the bonnet, this variant capable of taking the car from standstill to 60mph in only 4.7 seconds and on to a top speed of 168mph where allowed. All models drive the rear wheels through an eight-speed automatic gearbox with five different shift and throttle programmes and the option of full manual control using the steering wheel-mounted paddles. The 'GT-S' has variable gear ratio steering and electronic suspension which can be set to one of five modes. In the 'Sport' or 'Sport+' driving settings, the engine emits an exciting growl. In fact, this car is almost everything you wouldn't expect a Kia to be. This model is a five-door hatch aimed at slinkier premium-badged models like Audi's A5 Sportback and BMW's 3 Series GT, plus also perhaps, four-door saloons with coupe-like rear styling like Volkswagen's Arteon. 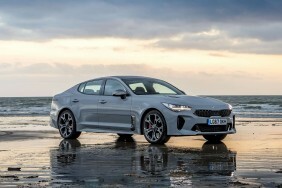 Kia prefers to call the Stinger an executive 'gran turismo' and says that this model's styling 'evokes memories of the classic age of grand tourers'. Whatever your perspective on that, it's difficult to argue that this is one of the most strikingly styled Kia models we've seen to date. It certainly feels very opulent inside, where leather upholstery in either black, grey or red is standard across the range, as is front seat heating and electric adjustment for the D-shaped leather-trimmed steering wheel. More high-grade leather features on the dashboard and door armrests, plus there's an aluminium finish centre console, the highlight of which is an 8-inch colour infotainment touchscreen. Rear seat space is acceptable by class standards, with adequate legroom for even taller adults. Despite the coupe-like roofline, you shouldn't struggle for headroom either. And there's a decently-sixed 406-litre boot - though that's 74-litres less than you'd get in an Audi A5 Sportback. There are five Stinger variants, based on three trim grades. 'GT-Line' and 'GT-Line S' models get the 2.0-litre T-GDi turbo petrol or 2.2-litre CRDi diesel power and are priced from about £32,000. The flagship GT-S uses only the top 3.3-litre T-GDi petrol V6 and costs around £40,500. That's about £7,000 less than a comparably-performing Audi S5 Sportback. All models are well equipped, featuring an 8.0-inch touchscreen navigation system with European mapping and a Traffic Messaging Channel. The Stinger can be connected to Android Auto and Apple CarPlay via a smartphone, has Bluetooth with voice recognition and music streaming and is equipped with a reversing camera, front and rear parking sensors and a 7.0-inch Thin Film Transistor (TFT) supervision cluster. A head-up display is also a standard feature, which displays speed and navigation instruction. The base 'GT-Line' derivative has a nine-speaker sound system with front under-seat subwoofer, while the other two trim grades feature a 15-speaker harman/kardon premium sound system with subwoofer, external amp and front centre speaker. Leather upholstery and eight-way power-adjustable memory front seats are also standard. Standard safety features to assist drivers on long journeys include Autonomous Emergency Braking, Lane Keep Assist, Driver Attention Warning and Speed Limit Information. GT-Line S and GT-S also have Blind Spot Detection with Rear Cross Traffic Alert, and GT-S is fitted with Brembo brakes. A limited slip differential is standard, as is an Active Bonnet to protect the heads of pedestrians in the event of a collision. The efficiency figures recorded here aren't bad but they still illustrate that this South Korean brand has a little way to match its German competitors in this regard. 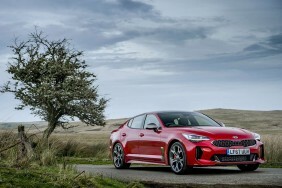 The 2.2-litre 197bhp CRDi turbodiesel Stinger variant is capable of 147g/km of CO2 and up to 50.4mpg, giving Kia's gran turismo a touring range of more than 600 miles. For the 2.0 T-GDi petrol variant, the figures are 35.8mpg and 181g/km, while for the top 3.3-litre T-GDi, you're looking at 28.5mpg and 225g/km. As with all Kias, the Stinger is covered by a seven-year, 100,000-mile warranty that's longer than any other car in the same class. If the car is sold through a Kia Used Approved Dealership when less than 18 months old or with less than 18,000 miles on the clock, the warranty will be topped up to match that of a new model. Servicing should be affordable and the various pre-paid servicing packages you can buy will further help manage costs in this regard, with 'Care-3' or 'Care-3 Plus' packages offering retail customers fixed-cost, inflation-proof servicing for either three or five years.